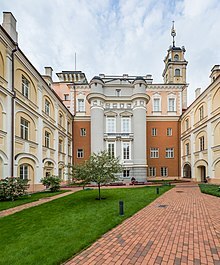 Vilnius University (Lithuanian: Vilniaus universitetas; former names exist) is the oldest university in the Baltic states and one of the oldest in Northern Europe. It is the largest university in Lithuania. Following Soviet invasion of Poland in September 1939, the university was briefly administered by the Lithuanian authorities (from October 1939), and then after Soviet annexation of Lithuania (June 1940), punctuated by a period of German occupation after German invasion of the Soviet Union (1941–1944), administrated as Vilnius State University by the Lithuanian Soviet Socialist Republic. In 1945 the Polish community of students and scholars of Stefan Batory University was transferred to Nicolaus Copernicus University in Toruń. After Lithuania regained its independence in 1990, following the dissolution of the Soviet Union, it resumed its status as one of the prominent universities in Lithuania. The wide-ranging Vilnius University ensemble represents all major architectural styles that predominated in Lithuania: Gothic, Renaissance, Baroque and Classicism. The university has been known by many names during its history. 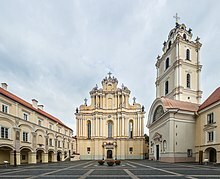 Due to its long history of Jewish, Polish and Russian influence or rule, the city portion of its name is rendered as Vilna (Latin), Wilna (German) or Wilno (Polish), in addition to Lithuanian Vilnius (see History of Vilnius). 1579–1782: Alma Academia et Universitas Vilnensis Societatis Iesu. The Latin name is rendered into English as Jesuit Academy, Jesuit College, or Academy of Vilnius (Vilna/Wilna/Wilno). A bronze door at the Vilnius University Library commemorates the first Lithuanian book. In 1568, the Lithuanian nobility asked the Jesuits to create an institution of higher learning either in Vilnius or Kaunas. The following year Walerian Protasewicz, the bishop of Vilnius, purchased several buildings in the city center and established the Vilnian Academy (Almae Academia et Universitas Vilnensis Societatis Jesu). Initially, the academy had three divisions: humanities, philosophy, and theology. The curriculum at the college and later at the academy was taught in Latin. At the beginning of the 17th century there are records about special groups that taught Lithuanian-speaking students Latin, most probably using Konstantinas Sirvydas' compiled dictionary. The first students were enrolled into the Academy in 1570. A library at the college was established in the same year, and Sigismund II Augustus donated 2500 books to the new college. In its first year of existence the college enrolled 160 students. On April 1, 1579, Stefan Batory King of Poland and Grand Duke of Lithuania, upgraded the academy and granted it equal status with the Kraków Academy, creating the Alma Academia et Universitas Vilnensis Societatis Iesu. His edict was approved by Pope Gregory XIII's bull of October 30, 1579. The first rector of the Academy was Piotr Skarga. He invited many scientists from various parts of Europe and expanded the library, with the sponsorship of many notable persons: Sigismund II Augustus, Bishop Walerian Protasewicz, and Kazimierz Lew Sapieha. Lithuanians at the time comprised about one third of the students (in 1568 there were circa 700 students), others were Germans, Poles, Swedes, and even Hungarians. The Grand Courtyard of Vilnius University and Church of St. Johns. In 1575, Duke Mikołaj Krzysztof Radziwiłł and Elżbieta Ogińska sponsored a printing house for the academy, one of the first in the region. The printing house issued books in Latin and Polish and the first surviving book in Lithuanian printed in the Grand Duchy of Lithuania was in 1595. It was Kathechismas, arba Mokslas kiekvienam krikščioniui privalus authored by Mikalojus Daukša. The academy's growth continued until the 17th century. The following era, known as The Deluge, led to a dramatic drop in the number of students who matriculated and in the quality of its programs. In the middle of the 18th century, education authorities tried to restore the academy. This led to the foundation of the first observatory in the Polish-Lithuanian Commonwealth (the fourth such professional facility in Europe), in 1753, by Tomasz Żebrowski. The Commission of National Education (Polish: Komisja Edukacji Narodowej), the world's first ministry of education, took control of the academy in 1773, and transformed it into a modern University. The language of instruction (as everywhere in the commonwealth's higher education institutions) changed from Latin to Polish. Thanks to the rector of the academy, Marcin Poczobutt-Odlanicki, the academy was granted the status of "Principal School" (Polish: Szkoła Główna) in 1783. The commission, the secular authority governing the academy after the dissolution of the Jesuit order, drew up a new statute. The school was named Academia et Universitas Vilnensis. After the Partitions of Polish-Lithuanian Commonwealth, Vilnius was annexed by the Russian Empire. However, the Commission of National Education retained control over the academy until 1803, when Tsar Alexander I of Russia accepted the new statute and renamed it The Imperial University of Vilna (Императорскiй Виленскiй Университетъ). The institution was granted the rights to the administration of all education facilities in the former Grand Duchy of Lithuania. Among the notable personae were the curator (governor) Adam Jerzy Czartoryski and rector Jan Śniadecki. The university flourished. It used Polish as the instructional language, although Russian was added to the curriculum. It became known for its studies of Belarusian and Lithuanian culture. By 1823, it was one of the largest in Europe; the student population exceeded that of the Oxford University. A number of students, among them poet Adam Mickiewicz, were arrested in 1823 for conspiracy against the tsar (membership in Filomaci). In 1832, after the November Uprising, the university was closed by Tsar Nicholas I of Russia. Two of the faculties were turned into separate schools: the Medical and Surgical Academy (Akademia Medyko-Chirurgiczna) and the Roman Catholic Academy (Rzymsko-Katolicka Akademia Duchowna). But soon they were closed as well with Medical and Surgical Academy transformed into Medical faculty of University of Kiev (now Bogomolets National Medical University), and latter one being transformed into Saint Petersburg Roman Catholic Theological Academy (after the October Revolution of 1917 moved to Poland where it became Catholic University of Lublin). The repression that followed the failed uprising included banning the Polish and Lithuanian languages; all education in those languages was halted. Lithuania declared its independence in February 1918. The university, with the rest of Vilnius and Lithuania, was opened three times between 1918 and 1919. The Lithuanian National Council re-established it in December 1918, with classes to start on January 1, 1919. An invasion by the Red Army interrupted this plan. A Lithuanian communist, Vincas Kapsukas-Mickevičius, then sponsored a plan to re-open it as "Labor University" in March 1919 in the short-lived Lithuanian Soviet Socialist Republic (later, Lithuanian–Belorussian Soviet Socialist Republic), but the city was taken by Poland in April 1919. Marshall Józef Piłsudski reopened it as Stefan Batory University (Uniwersytet Stefana Batorego) on August 28, 1919. The city would fall to the Soviets again in 1920, who transferred it to the Lithuanian state after their defeat in the battle of Warsaw. Finally, in the aftermath of the Żeligowski's Mutiny and Republic of Central Lithuania general election, 1922, the Vilnius Region was subsequently annexed by Poland. In response to the dispute over the region, many Lithuanian scholars moved to Vytautas Magnus University in Kaunas, the interwar capital. P. Smuglevičius hall in the Vilnius University Library. The university quickly recovered and gained international prestige, largely because of the presence of notable scientists such as Władysław Tatarkiewicz, Marian Zdziechowski, and Henryk Niewodniczański. Among the students of the university at that time was future Nobel prize winner Czesław Miłosz. The university grew quickly, thanks to government grants and private donations. Its library contained 600,000 volumes, including historic and cartographic items which are still in its possession. The university's international students included 212 Russians, 94 Belarusians, 85 Lithuanians, 28 Ukrainians and 13 Germans. Anti-Semitism increased during the 1930s and a system of ghetto benches, in which Jewish students were required to sit in separate areas, was instituted at the university. Violence erupted; the university was closed for two weeks during January 1937. In February Jewish students were denied entrance to its grounds. The faculty was then authorized to decide on an individual basis whether the segregation should be observed in their classrooms and expel those students who would not comply. 54 Jewish students were expelled but were allowed to return the next day under a compromise in which in addition to Jewish students, Lithuanian, Belarusian, and "Polish democratic" students were to be seated separately. Rector of the university, Władysław Marian Jakowicki, resigned his position in protest over the introduction of the ghetto benches. Following the invasion of Poland the university continued its operations. The city was soon occupied by the Soviet Union. Most of the professors returned after the hostilities ended, and the faculties reopened on October 1, 1939. On October 28, Vilnius was transferred to Lithuania which considered the previous eighteen years as an occupation by Poland of its capital. The university was closed on December 15, 1939 by the authorities of the Republic of Lithuania. All the faculty, staff, and its approximately 3,000 students dismissed. Students were ordered to leave the dormitories; 600 ended in a refugee camp. Professors had to leave their university flats. Following the Lithuanization policies, in its place a new university, named Vilniaus universitetas, was created. Its faculty came from the Kaunas University. The new charter specified that Vilnius University was to be governed according to the statute of the Vytautas Magnus University of Kaunas, and that Lithuanian language programs and faculties would be established. Lithuanian was named as the official language of the university. A new academic term started on 22 January; only 13 of the new students had former Polish citizenship. Polish Law and Social Sciences, Humanities, Medical, Theological, Mathematical-Life sciences faculties continued to work underground with lectures and exams held in private flats until 1944. Polish professors who took part in the underground courses included Iwo Jaworski, Kazimierz Petrusewicz and Bronisław Wróblewski. The diplomas of the underground universities were accepted by many Polish universities after the war. Soon after the annexation of Lithuania by the Soviet Union, while some Polish professors were allowed to resume teaching, many others (along with some Lithuanian professors) who were deemed "reactionary" were arrested and sent to prisons and gulags in Russia and Kazakhstan. Between September 1939 and July 1941, the Soviets arrested and deported nineteen Polish faculty and ex-faculty of the University of Stefan Batory, of who nine perished: Professors Stanisław Cywinski, Władysław Marian Jakowicki, Jan Kempisty, Józef Marcinkiewicz, Tadeusz Kolaczyński, Piotr Oficjalski, Włodzimierz Godłowski, Konstanty Pietkiewicz, and Konstanty Sokol-Sokolowski, the last five victims of the Katyn massacre. The city was occupied by Germany in 1941, and all institutions of higher education for Poles were closed. From 1940 until September 1944, under Lithuanian professor and activist Mykolas Biržiška, the University of Vilnius was open for Lithuanian students under supervision of the German occupation authorities. In 1944, many of Polish students took part in Operation Ostra Brama. The majority of them were later arrested by the NKVD and suffered repressions from their participation in the Armia Krajowa resistance. Petras Repšys’ fresco "The Seasons of the Year" (painted in 1976-1984) with motifs from Baltic mythology at the Centre of Lithuanian Studies. Educated Poles were transferred to People's Republic of Poland after World War II under the guidance of State Repatriation Office. As the result many of former students and professors of Stefan Batory joined universities in Poland. To keep contact with each other, the professors decided to transfer whole faculties. After 1945, most of the mathematicians, humanists and biologists joined the Nicolaus Copernicus University in Toruń, while a number of the medical faculty formed the core of the newly founded Medical University of Gdańsk. The Toruń university is often considered to be the successor to the Polish traditions of the Stefan Batory University. In 1955 the University was named after Vincas Kapsukas. After it had been awarded the Order of the Red Banner of Labour in 1971 and the Order of Friendship of Peoples in 1979, its full name until 1990 was Vilnius Order of the Red Banner of Labour and Order of Friendship of Peoples V. Kapsukas State University. Though restrained by the Soviet system, Vilnius University grew and gained significance and developed its own, Lithuanian identity. Vilnius University began to free itself from Soviet ideology in 1988, thanks to the policy of glasnost. On March 11, 1990, Lithuania declared independence, and the university regained autonomy. Since 1991, Vilnius University has been a signatory to the Magna Charta of the European Universities. It is a member of the European University Association (EUA) and the Conference of Baltic University Rectors. In modern times, the university still offers studies with an internationally recognized content. There are 3 Bachelor and 16 Master study programs in English. As of 10 October 2017, there were 19768 students attending Vilnius University. The current rector is Professor Artūras Žukauskas. The university, specifically the courtyard, was featured in the American TV series The Amazing Race 12. Faculties of Physics, Economy, Law, and Communication, as well as Business School, Life Sciences Center, and Scholarly Communication and Information Centre are located in Saulėtekis district. Vilnius University is ranked 401-410 among World top universities by 2018 QS World University Rankings. In 2017 QS WU Rankings by Subject, Vilnius University is ranked 201-250 in Linguistics and 251-300 in Physics and Astronomy. In QS rankings of Emerging Europe and Central Asia, Vilnius University is ranked 21. Vilnius University is ranked 601-800 in the world and 291 in Europe by Times Higher Education World University Rankings. "Laser Spectrometer for Testing of Coatings of Crystals and Optical Components in Wide Spectral and Angle Range". NATO Science for Peace programme project. NATO SfP-972534. 1999-2002. "Cell biology and lasers: towards new technologies". Vilnius University - UNESCO Associated Centre of Excellence. "Science and Society: Genomics and Benefit Sharing with Developing Countries - From Biodiversity to Human Genomics (GenBenefit)". Doc. E. Gefenas (Faculty of Medicine). 2006-2009. "Citizens and governance in a knowledge-based society: Social Inequality and Why It Matters for the Economic and Democratic Development of Europe and Its Citizens. Post-Communist Central and Eastern Europe in Comparative Perspective (EUREQUAL)." Doc. A. Poviliūnas (Faculty of Philosophy). 2006-2009. "Marie Curie Chairs: Centre for Studies and Training Experiments with Lasers and Laser Applications (STELLA)". A. Dubietis (Faculty of Physics). 2006-2009. "Research Infrastructure Action: Integrated European Laser Laboratories (LaserLab-Europe)". Prof. A. Piskarskas (Faculty of Physics). 2004-2007. "Nanotechnology and nanoscieces, knowledge-based multifunctional materials, new production processes and devices: Cell Programming by Nanoscaled Devices (CellPROM)". Prof. A. Kareiva (Faculty of Chemistry). 2004-2009. Advanced European Infrastructures for Detectors at Accelerators - AIDA-2020 (Institute of Applied Research, Faculty of Physics). J.V.Vaitkus, G. Tamulaitis. 2015-2019. EU-STRAT - The EU and Eastern Partnership Countries: An Inside-Out Analysis and Strategic Assessment (EU-STRAT) (Institute of International Relations and Political Science). R.Vilpišauskas. 2016-2019. European Network of Research Ethics and Research Integrity. European Ethics and Research Integrity Network. E. Gefenas (Faculty of Medicine). 2016-2019. Vilnius University has signed more than 180 bilateral cooperation agreements with universities in 41 countries. Under Erasmus+ programme the university has over 800 agreements with 430 European and 55 agreements with partner country universities for the academic exchanges. The University is a signatory of the Magna Charta of European universities and a member of the International Association of Universities, European University Association, the Conference of Baltic University Rectors, the Utrecht Network, UNICA Network, and the Baltic Sea Region University Network. In addition, Vilnius University has been invited to join the Coimbra Group, a network of prestigious European universities, from 1 January 2016. Edmundas Rimša historian, specialist of heraldics, sfragistics and genealogy. Wikimedia Commons has media related to Vilnius University. Vilnius University Folklore Ensemble "Ratilio"
^ Iłowiecki, Maciej (1981). Dzieje nauki polskiej. Warszawa: Wydawnictwo „Interpress”. p. 241. ISBN 83-223-1876-6. ^ Lithuania Today. "Gintaras". 1978. Retrieved 9 March 2011. ^ Lola Romanucci-Ross; George A. De Vos (1995). Ethnic identity: creation, conflict, and accommodation. Rowman Altamira. p. 251. ISBN 978-0-7619-9111-3. Retrieved 9 March 2011. ^ Czesław Miłosz (1983). The history of Polish literature. University of California Press. pp. 114–. ISBN 978-0-520-04477-7. Retrieved 9 March 2011. ^ Antanas Jusaitis; Lithuanian Catholic Truth Society (1918). The history of the Lithuanian nation and its present national aspirations. The Lithuanian Catholic Truth Society. pp. 74–. Retrieved 9 March 2011. ^ Giedrė Mickūnaitė (2006). Making a great ruler: Grand Duke Vytautas of Lithuania. Central European University Press. pp. 156–. ISBN 978-963-7326-58-5. Retrieved 9 March 2011. ^ Norman Davies (May 2005). God's Playground: 1795 to the present. Columbia University Press. pp. 169–. ISBN 978-0-231-12819-3. Retrieved 9 March 2011. ^ Jerzy Jan Lerski (1996). Historical dictionary of Poland, 966-1945. Greenwood Publishing Group. pp. 629–. ISBN 978-0-313-26007-0. Retrieved 9 March 2011. ^ Organisation for Economic Co-operation and Development; Centre for Co-operation with Non-members (2002). Lithuania. OECD Publishing. p. 201. ISBN 978-92-64-18717-7. Retrieved 9 March 2011. ^ Oskar Halecki (1958). From Florence to Brest (1439-1596). Fordham University Press. Retrieved 9 March 2011. ^ Oskar Garstein (1992). Rome and the Counter-Reformation in Scandinavia: Jesuit educational strategy, 1553-1622. BRILL. p. 236. ISBN 978-90-04-09393-5. Retrieved 9 March 2011. ^ "JESUITS IN LITHUANIA (A SHORT HISTORY)". Baltic Jesuit advancement project. Retrieved 2011-03-09. ^ Hugh Chisholm (1911). The Encyclopædia britannica: a dictionary of arts, sciences, literature and general information. The Encyclopædia Britannica Company. p. 166. Retrieved 11 March 2011. ^ Jonas Kubilius (1979). A Short history of Vilnius University. Mokslas. Retrieved 9 March 2011. ^ Tomas Venclova (2002). Vilnius: city guide. R. Paknio leidykla. ISBN 978-9986-830-48-1. Retrieved 9 March 2011. ^ a b Soviet physics-collection. Allerton Press. 1979. Retrieved 9 March 2011. ^ Miriam A. Drake (2005). Encyclopedia of library and information science, second edition. CRC Press. pp. 327–. ISBN 978-0-8493-3894-6. Retrieved 9 March 2011. ^ Laimonas Briedis (1 March 2009). Vilnius: city of strangers. CEU Press. ISBN 978-963-9776-44-9. Retrieved 9 March 2011. ^ Marcel Cornis-Pope; John Neubauer (15 July 2007). History of the literary cultures of East-Central Europe: junctures and disjunctures in the 19th and 20th centuries. John Benjamins Publishing Company. pp. 6–. ISBN 978-90-272-3455-1. Retrieved 9 March 2011. ^ David H. Stam (1 November 2001). International dictionary of library histories. Taylor & Francis. p. 926. ISBN 978-1-57958-244-9. Retrieved 10 March 2011. ^ a b c d e f g Sarunas Liekis; Šarūnas Liekis (1 January 2010). 1939: the year that changed everything in Lithuania's history. Rodopi. pp. 174–175. ISBN 978-90-420-2762-6. Retrieved 9 March 2011. ^ The Current digest of the Soviet Press. American Association for the Advancement of Slavic Studies. 1955. Retrieved 9 March 2011. ^ a b c d Zinkevičius, Zigmas (1988). Lietuvų kalbos istorija (Senųjų raštų kalba) (in Lithuanian). Vilnius: Mintis. p. 159. ISBN 5-420-00102-0. ^ Zinkevičius, Zigmas (1988). Lietuvų kalbos istorija (Senųjų raštų kalba) (in Lithuanian). Vilnius: Mintis. p. 160. ISBN 5-420-00102-0. ^ a b Kevin O'Connor (2006). Culture and customs of the Baltic states. Greenwood Publishing Group. pp. 81–. ISBN 978-0-313-33125-1. Retrieved 10 March 2011. ^ Zinkevičius, Zigmas (1988). Lietuvų kalbos istorija (Senųjų raštų kalba) (in Lithuanian). Vilnius: Mintis. p. 161. ISBN 5-420-00102-0. ^ Jerzy Jan Lerski (1996). Historical dictionary of Poland, 966-1945. Greenwood Publishing Group. pp. 74–. ISBN 978-0-313-26007-0. Retrieved 10 March 2011. ^ Marcel Cornis-Pope; John Neubauer (13 September 2006). History of the literary cultures of East-Central Europe: junctures and disjunctures in the 19th and 20th centuries. John Benjamins Publishing Company. pp. 19–. ISBN 978-90-272-3453-7. Retrieved 10 March 2011. ^ Ted Tapper; David Palfreyman (23 December 2004). Understanding mass higher education: comparative perspectives on access. Psychology Press. pp. 141–. ISBN 978-0-415-35491-2. Retrieved 10 March 2011. ^ a b Piotr Stefan Wandycz (1974). The lands of partitioned Poland, 1795-1918. University of Washington Press. pp. 95–. ISBN 978-0-295-95358-8. Retrieved 9 March 2011. ^ a b Tomas Venclova (Summer 1981). FOUR CENTURIES OF ENLIGHTENMENT: A Historic View of the University of Vilnius, 1579-1979. Lituanus. Retrieved 2009-01-13. ^ a b c d e Emanuel Melzer (1997). No way out: the politics of Polish Jewry, 1935-1939. Hebrew Union College Press. pp. 74–76. ISBN 978-0-87820-418-2. Retrieved 10 March 2011. ^ Ludwik Hass (1999). Wolnomularze polscy w kraju i na śwíecíe 1821-1999: słownik biograficzny. Rytm. p. 183. ISBN 978-83-87893-52-1. Retrieved 11 March 2011. ^ a b "Страны мира". Countries. Retrieved 31 May 2015. ^ "Facts and Figures". Retrieved 9 December 2017. ^ "Administration – Vilnius University". Retrieved 9 December 2017. ^ "Faculties, Institutes, Centres & Other Departments". Retrieved 2018-07-18. ^ "Maps and Pictures". Retrieved 2017-12-09. ^ "Vilnius University". Top Universities. 2015-07-16. Retrieved 2017-05-27. ^ "Research - News Centre". Archived from the original on 2012-02-10. Retrieved 31 May 2015. Łossowski, Piotr (1991). Likwidacja Uniwersytetu Stefana Batorego przez władze litweskie w grudniu 1939 roku (in Polish). Warszawa: Interlibro. ISBN 83-85161-26-0.